In the recent redecoration of my own home, I chose rich wall colors of amber, periwinkle, dove gray and coach-light green. Along with ramping up the pattern content amongst my fabrics, curtains and upholstery, I knew that some relief from all that noise would be essential. I surmised that the accessories and lamps needed to simplify and freshen the outcome. Without leaving out the warmth that accessories provide a home, I simply edited down my collection and only used objects (in particular my porcelain and china selections) that were white. My inspiration was hatched from the acquisition of two vintage Blanc de chine garden stools. So popular during the 1950’s and the mid 1980’s, Blanc de chine has been enjoying a nascent revival at the auctions. Blanc de chine (French for “white from China”) is the term traditionally that Europeans dubbed a white porcelain commonly produced in Dehua in the Fujian province of China. Though produced during the Ming Dynasty, as far back as the 14th century, it was only during the 18th century that large quantities were imported to Europe and copied by Meissen and other noted porcelain manufacturers. The kilns along the Fujian coast limited the amount of iron oxide in the porcelain, avoiding the unpleasant, undesirable straw color and allowing a purer white, or warm, pale ivory to come forth. Besides vases, jars, bowls and teapots, the craftsmen at Dehua were most famous for their figurative forms. Buddhist and Taoist figures, puppets and animals were popular before the Cultural Revolution, after which “immaculate statuettes” of revolutionary heroes and their Great Leader were produced along with portraits of popular opera stars. My own Blanc de chine porcelain garden stools, featuring coy fish swimming over an abstracted fish-scale ocean, are charmingly naïve and in their white on white raised bas relief offer up an eye catching moment of visual rest in my color-saturated home. Tom Britt, among other leaders in interior design, accessorized successfully with white calming his visually electric environment. I once found myself seated in Tom’s dramatic reception room, where his massive bookcases were filled with large volumes. And rather than the cacophony of noisy book jackets, Tom had wrapped every book in white vellum, with the title subtly written in calligraphy on the white book jacket spines. 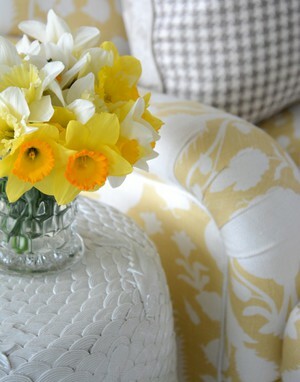 In rooms with colorful, busy, wallpaper and patterns, the relief that white accessories endow the space is invaluable. These accessories act almost like negative meditations whose blank forms carve silhouettes of calm into the riotous pattern and jumble of “stuff.” In kitchens, where complicated cabinets, hardware, fixtures and appliances vie for focus, white plates hung on the wall can bring warmth as accessories and a neutral shelter from the other demanding players. It is preferable to select white china with unusual shapes such as octagons, ovals, or even pieces with interesting piercings that vary the silhouette, once again drawing the eye toward the space in between as much as the negative space the white occupies. To relieve the sometimes relentless darkness of wood paneled rooms, the stark contrast of white can bring about a pleasing modernity. Besides her upholstery and floors covered with white Berber carpets, one of my clients chose to lighten her dark ski chalet with a spectacular collection of mid-century bisque-ware. This bisque-ware, devoid of a shiny glaze and is completely matte in texture, found its zenith in the intricately cast mid-century pottery whose eccentric shapes and patterned surface reliefs tantalized the modernist sensibility. 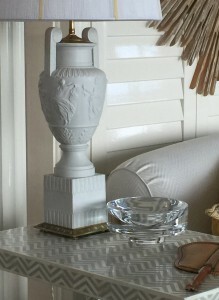 Found in classical form as well as during the 1920’s, these dazzling white urns, plates and tazzas fit well into the Hepplewhite world, introducing a neoclassical revivalist taste to a more contemporary leaning world. Spring cleansing with white can be a delightful attitude to adopt. Lamps, occasional tables, and side tables might add some starch but eliminate the stiffness by stifling the stuffiness. One might be astonished how much white one has collected and perhaps not thought to display. As an exercise, declutter the color, restore the white, and stylish results may likely develop. I have been thrilled with this exercise having applied it to my own home. I hope it will inspire you as well. Thursday, February 18, 2016Don’t Miss the March Issue of House Beautiful! Thursday, September 27, 2018Cherokee Club in Atlanta, GA! Saturday, August 11, 2018Acorns in Highlands, NC Lecture and Reception! Wednesday, August 8, 2018Lecture at the Northeast Harbor Library! Sunday, June 24, 2018Champagne Brunch and Lecture in Beaufort, NC! Friday, June 22, 2018Protocol Giftshop Booksigning in Wilmington, NC! Thursday, June 21, 2018The Country Bookshop Lecture and Booksigning! Saturday, April 7, 2018Art By Design Event in Memphis TN!